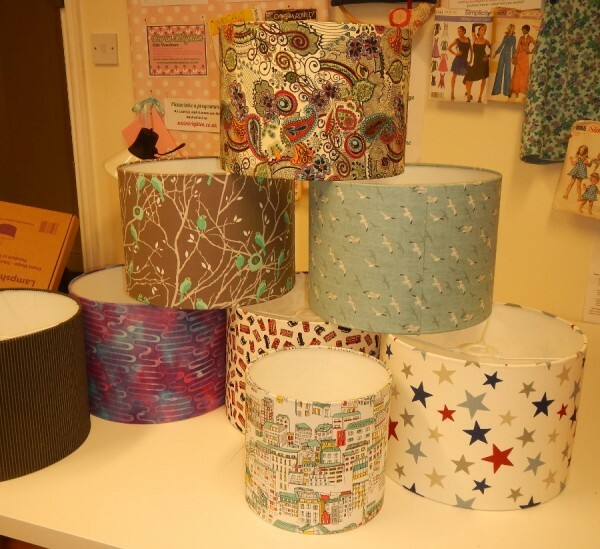 I’ve just been on a workshop on making quick and easy lampshades. Years ago my mother taught me how to make lampshades the traditional way, by wrapping bias binding round the frame and then hand-stitching the fabric to the bias binding, whilst with the third hand trying to keep the tension on the fabric in several directions at once. Since then, I’ve gone for the ‘quick dash into Ikea’ approach to lampshades, often ending up with something fairly neutral that I would then spot everywhere else I went. The joy of these lampshade kits is that you can use any fabric you want, and can produce a professional-looking shade without hours of tugging, tweaking and hand-stitching. Magic! The kits come from Needcraft and the workshop was at Sew In Brighton. Here’s a collection of shades by different students on the workshop – all came out looking good, and all so different. For my particular shade I used some batik fabric that I made a long time ago, which has been sitting in a cupboard for a long long time. It is cotton lawn, coloured with a batik process using the trusty potato-masher. The first stage was to paint on some fairly pale Procion dye in pinks and turquoises. Then the hot wax was applied with the potato-masher, and finally the fabric was re-painted with more concentrated, darker Procion dye. A kit is a far cry from the traditional hand-stitched approach – but the net result is very professional looking. I would like to try using whole range of original art-textiles and making them into shades – batik, printing, marbling spring to mind. 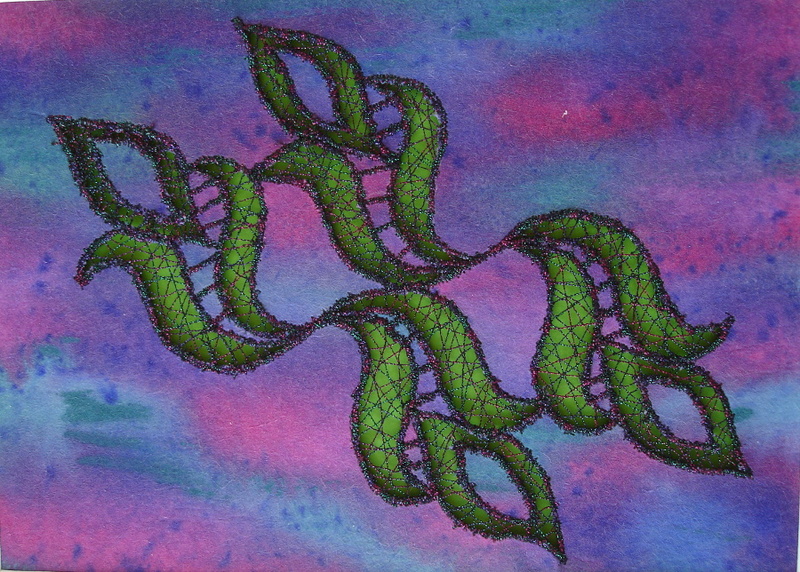 And of course stitching. I’m pondering using the technique of cutting away parts of the fabric and machine stitching over the holes – probably by bonding the fabric to the stiff backing PVC first, and then cutting through both and stitching both at the same time. Like this cut-away image below – maybe even the same design (which came from a repeat-pattern that I developed from a collage). But instead of the green backing there would be a hole that lets light through. I sense some experiments looming! Machine embroidered cut-away design on dyed pelmet-vilene. 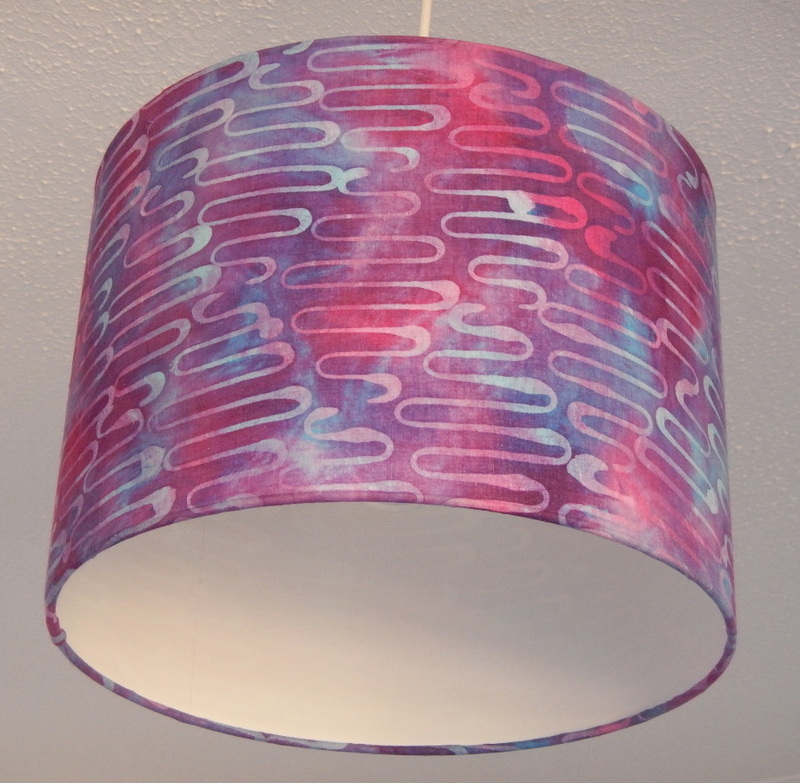 This entry was posted in News and tagged batik, hot wax, Lampshade, lampshade kit, Needcraft on April 29, 2015 by Jane.